The Korea Herald is publishing a series of articles highlighting South Korea’s promising startups in the emerging sectors of digital health care and next-generation medical devices. This is the 22nd installment. - Ed. Most people have undergone a health checkup where a nurse puts on a cuff on your upper arm that tightens and releases, to measure your blood pressure. You’re most likely to be doing this at a hospital. However, this dynamic may soon change with new advances in digital health technologies and analytic techniques. 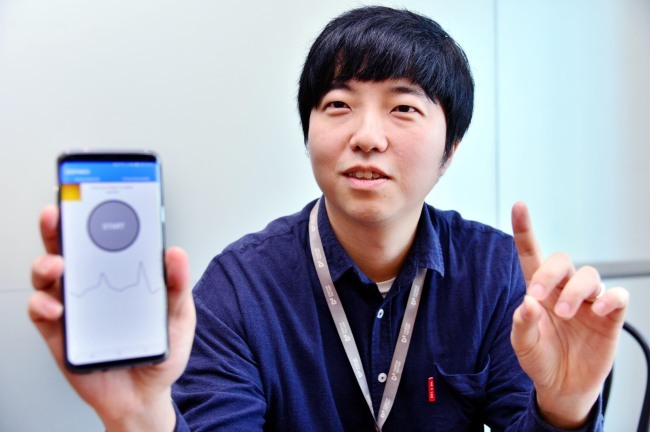 A health care technology startup in South Korea has built a solution that uses a smartphone’s basic features to measure blood pressure, a health marker that continues to require specialized devices to read. 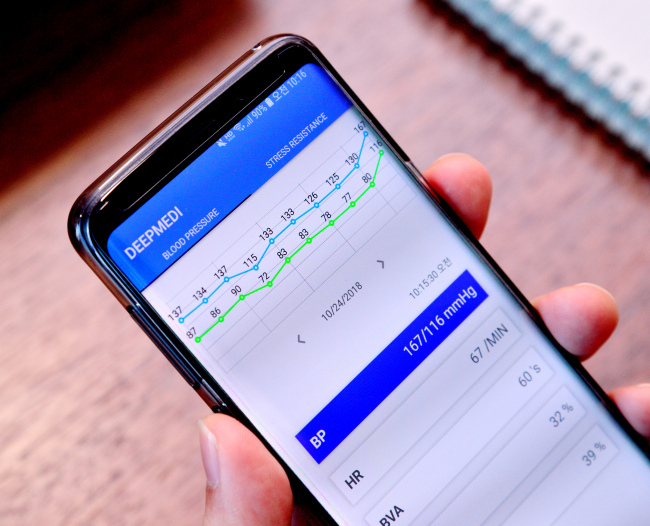 Seoul-based Deep Medi is preparing to launch software in the form of a mobile app that uses a phone’s camera to optically measure a person’s blood pressure. The steps are simple: Place your finger on the camera lens, hold for one minute and view your blood pressure level. Despite the apparent simplicity, the app’s underlying software is more complex. The app’s camera illuminates the skin and measures changes in light absorption, as skin tone undergoes subtle changes depending on how much blood is circulated per heartbeat. The differences are usually imperceptible to the human eye. But, software powered by artificial intelligence can pick up the subtle variations and use them to deduce blood pressure levels with mathematical algorithms. Widening its applications, Deep Medi’s solution doesn’t require an exceptionally high-resolution camera to work, said the firm’s CEO Lee Kwang-jin. Internal tests conducted by the startup have proved the solution’s compatibility with smartphones made in as early as 2016. Common blood pressure readings involve two numbers – one measuring systolic blood pressure and one for diastolic blood pressure. Right now, Deep Medi says its blood pressure measuring solution meets accuracy requirements for diastolic blood pressure, and it is working to raise the accuracy of its systolic blood pressure readings before seeking medical device designation from health regulators in Korea and abroad. “Until now, the conventional method of measuring blood pressure levels is to use an inflatable cuff around the arm that tightens and releases the artery to determine blood pressure levels,” Lee told The Korea Herald in a recent interview. The concept of using a phone’s camera lens to track health indicators is not new. A wide variety of free apps monitor heart rates using a camera. However, the startup claims to be the first to have successfully developed algorithms to accurately deduce blood pressure using a standard phone camera, as well as to begin large-scale data accumulation. Deep Medi thinks its app will have several commercial uses. It could be used as a blood pressure monitoring and maintenance tool, and the accumulated records could be used by doctors to guide diagnosis and more closely track patients’ status. The technology would also offer significant convenience to pharmaceutical companies conducting clinical trials for new drugs requiring blood pressure levels to be monitored regularly, Lee said. The startup is currently gathering clinical data both independently and in partnership with Yonsei University’s Gangnam Severance Hospital and the Seoul National University Bundang Hospital. After gathering sufficient clinical data, Deep Medi plans to get its software approved as a medical device by regulators, including the US Food and Drug Administration and Korea’s Ministry of Food and Drug Safety. It also plans to seek Europe’s CE mark certification for medical devices. With the approvals, it hopes to commercialize its app in major markets abroad. While regulatory approval preparations are underway, Deep Medi has already licensed out its proprietary algorithm’s application programming interface to interested clients, such as Seoul-based Partron, which supplies sensors and modules to companies like Samsung Electronics. It is also in talks with insurance provider MetLife to build insurance packages that use the blood pressure records that can be collected by Deep Medi’s medical software, the CEO said. To get more users onboard, the startup is also preparing to launch its solution in the form of a wellness app that offers users health tips and data on stress levels, based on his or her detected blood pressure levels. “We expect this wellness app, to be available free of charge, to get people interested in their blood pressure levels and to make more health-conscious decisions,” Lee said. Deep Medi was founded in 2017 by a group of biomedical signal processing engineers from the Gwangju Institute of Science and Technology, including Lee who jumped into business after completing his Ph.D. in biomedical engineering at GIST. The startup procured seed funding from Naver’s D2 Startup Factory accelerator last year. It is also one of three winners of this year’s Grants4Apps digital health startup acceleration program co-hosted by German pharma giant Bayer and the Korea Trade-Investment and Promotion Agency.